JT Petty’s third feature The Burrowers is another of his distinctively unusual takes on a generally conventional genre. Set in the Dakota Territory of 1879, where survival is already a challenge, Petty brings a starkly unglamorized sensibility to life and mortality on the Dakota prairie: it opens with a boy come a courting to a farmgirl only to discover a massacre and what appears to be the abduction of the girl. 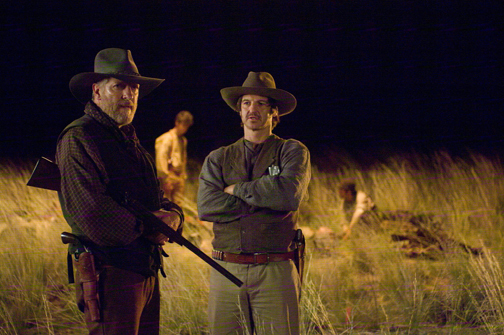 Clancy Brown and William Mapother, who have faces that look like they’ve survived tough times, are perfect as the leaders in a hunting party after a kidnapped girl: confident but unpretentious and very respectful of the country. But they think they’re tracking an Indian raiding party. What they find are fetid holes in the prairie ground filled with bone and blood and sinew, as if a body has been digested by the Earth. Which is close to the truth. Petty plays the unforgiving tensions between the settlers and the native tribes with palpable animosity, the distrust so great that their fragile truce snaps before they even take on the burrowers, the underground creatures that have been hunting on the prairie. He keeps the threat visually vague and the insect-like burrowers shadowy and smudged, creating his horror out of mystery and suggestion, but it’s nothing supernatural or alien. It’s a real western/horror/monster movie with a devoted frontier sensibility and loving nods to The Searchers. The film debuted at the Toronto International Film Festival and toured various festivals dedicated to films of the fantastic but was otherwise released direct to DVD by Lionsgate (they did the same thing with Ryuhei Kitamura’s English language debut Midnight Meat Train, adapted from the story by Clive Barker). The film deserves better. I spoke with Petty over the phone a couple of weeks before the April 21 DVD release. I’m always trying to get a little bit outside the genre. I think people who watch scary movies now are such a sophisticated group of watchers. We’re probably the first generation that takes multiple viewings for granted, that you can see anything as many times as you want to see it. We’re sort of the video generation and the twenty-year-olds now just assume they can see anything they want anytime they want as many times as they want. So what’s already been done, we’ve seen so many times that I think it’s hard to actually scare people inside that framework. So once you get a little outside the genre, you can hopefully surprise people again. What makes the combination of western and horror so resonant for you as a filmmaker? A lot of it is just they’re two of the most cinematic experiences that you have watching a movie. If a horror movie does well, it’s entirely because of the direction, it’s classically not the performance. All the things that do make a horror movie pornographic also make it exceptionally cinematic. If you have a well directed horror movie with a crappy story and bad actors, it can still be a pretty awesome horror movie. And to some extent, the same thing with the western. All of those spaghetti westerns with dubbed voices and obvious cartoonish characters but have this amazing cinematic strength to them still resonate. So I guess horror and western movies are both, in a very specific way, the most cinematic movie you can make. Is that a fair statement to make?